Nissan has a wide selection of cars that are perfect for your teenager and that are also great for keeping them safe while on the road. What makes them even better is that all of these brand-new Nissans are between $10-20,000 making them the perfectly affordable option for those shopping for a safe new car that will last and also have a great resell value when the time comes for their next car purchase! 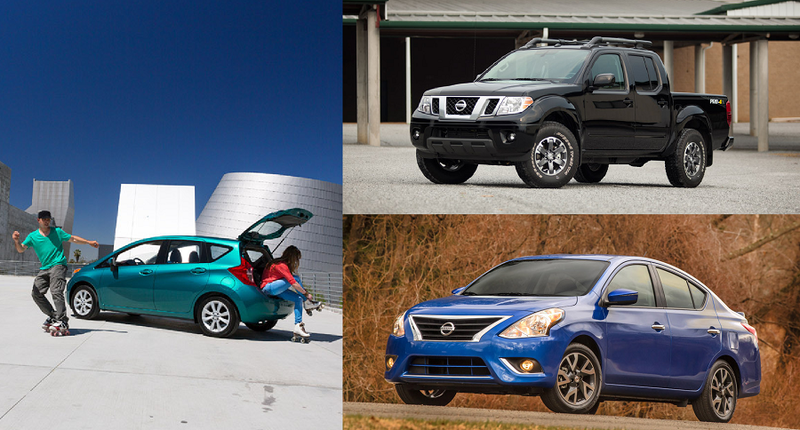 Whether it’s your teen’s first car or an amazing graduation present, be sure to consider one of these Nissan’s for your teenager! 2015 Nissan Versa Sedan: This stylish yet practical sedan has a starting MSRP of only $11,990 and achieves amazing fuel efficiency at an impressive 36 mpg highway and 27 mpg city*! The 2015 Nissan Versa offers plenty of savings on MSRP and at the pump! 2015 Nissan Versa Note: If you love the Versa, but you were hoping for something with a little more personality, check out the distinctive 2015 Nissan Versa Note! This convenient, versatile hatchback starts out at $14,180 and achieves the same gas mileage as the Versa sedan. The 2015 Versa Note was voted one of the 10 Tech-Savviest Cars Under $20,000 by Kelley Blue Book, so if your teenager always has their headphones in and if they are constantly glued to their iPhones, then they will love the impressive technology features like the standard iPod®/USB auxiliary input jack and the Bluetooth® Hands-free Phone System. 2015 Nissan Sentra: The refined 2015 Nissan Sentra is the perfect car for anyone looking for a reliable, safe sedan. The 2015 Sentra is designed to leave an impression and was awarded an IIHS Top Safety Pick. If your teenager loves to have their head buried in a book and hang out at the local coffee shop, then you can bet they will love a new 2015 Nissan Sentra. The starting MSRP for the 2015 Nissan Sentra is only $16,480, so if you are looking for something safe and reliable that will last, the Nissan Sentra is the car for you! 2015 Nissan Frontier: Perhaps you want to make sure your teenager is not driving around town with all of their friends in the backseat. Eliminate the option of a super-spacious backseat with the 2015 Nissan Frontier! The 2015 Nissan Frontier is also the perfect choice for the busy athlete or musician on the go! There is plenty of cargo space in the bed of the truck for muddy gear or heavy band equipment. The 2015 Frontier was recognized as a 2015 Most Popular Vehicle on Edmunds.com so you know your teenager will feel like the coolest kid at school rolling up in a powerful, rugged pickup truck. Find everything your teenager needs in the 2015 Nissan Frontier, starting at only $17,990!